Almost everyone has seen Tobe Hooper’s 1974 classic The Texas Chain Saw Massacre. And even if they haven’t, most still know two things about the movie. The first is that it includes some crazy killer with a chainsaw named Leatherface. The second is that it is based on the true story of Ed Gein – but only loosely. For those looking to watch a film a bit more accurate that also happens to be from 1974, I have one word for you: Deranged. While Hooper’s film took an approach more rooted in monster movies than reality, Jeff Gillen and Alan Ormsby’s film took a more restrained approach to Gein. 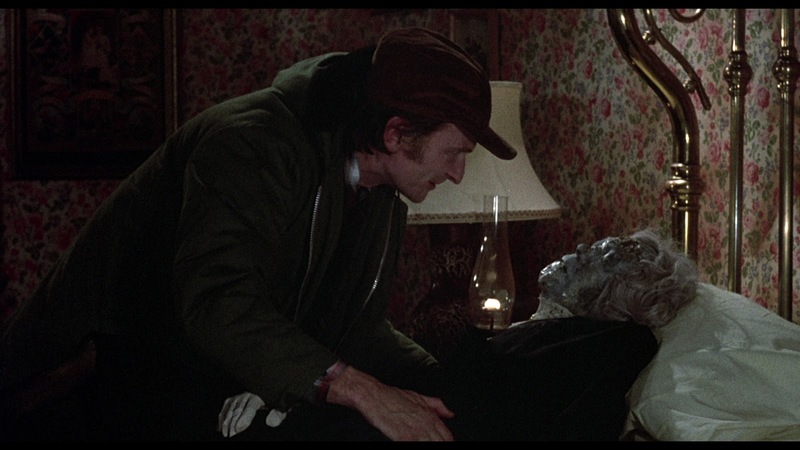 Instead of being a massive, hulking beast, the killer in Deranged is, well, just an ordinary-looking, simple guy. 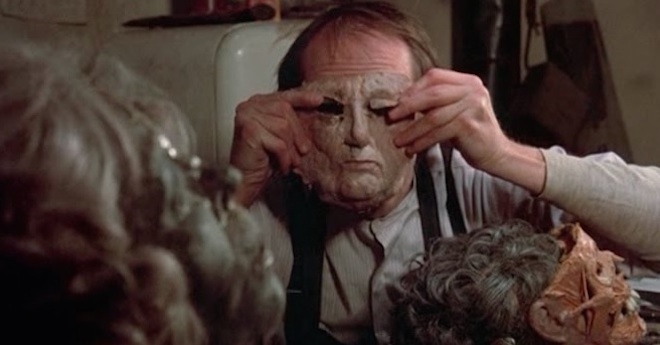 In the film, Roberts Blossom plays Ezra Cobb, a farmer with some serious Mommy Issues. Once his mother passes away, Ezra slowly delves deeper into insanity, going so far as to dig up her body and return it to their country home. But that’s just the beginning of it. Ezra, whose mother had demonized sexual relationships, begins to hunt down the women of the town and bring them home to join his mother. They join her at the dinner table; a similar scene will be shown two years later in Hooper’s film. Ezra is a born outsider; to the common person about town, he is looked upon with pity. He’s just a simple man, maybe one that’s a little strange, but nothing too harmless. Or so they think! The beauty of this film is how they portray Ezra Cobb. It’s a strange situation Deranged puts us in, and Blossom sharpens the idea of the pitiful, lonely outsider to a sharpened point. He does, in a way, come off as innocent. He’s confused, maybe a little scared, and not fully accepted by the outside world. He is controlled by his domineering mother, even after death, and cannot accept her passing. While Gunnar Hansen would play a monster who is maybe just as pitiful, there seems to be something much eviler under his dried, unnatural skin. Deranged is unique in terms of its presentation, something that has rarely been done ever since. With a soundtrack consisting only of a haunting funeral organ, a news reporter walks us through the story of Ezra Cobb, narrating us through Cobb’s sick and demented scenes of murder and lost hope. Set against a snowy, isolated backdrop, the film seems isolated and bone chilling. That, mixed with an unsettling sense of black humor, makes the movie more than worth your watch. If that’s not enough to get you interested, how does the involvement of Tom Savini sound? While his work here will pale in comparison to the grandiose expositions of bloodshed that he will master later in his career, it is nothing short of phenomenal to view a more primitive form of his effects wizardry. It’s not a particularly gory film, but there are plenty of macabre sequences nonetheless. Cobb’s decaying mother looks especially disgusting in this film, and Savini is the brains behind it. So…what happened? Why did The Texas Chain Saw Massacre completely overshadow this film, when Deranged came out in the same year? For one thing, the unconventional faux-documentary style would surely have to do with it. It’s a much quieter and more reserved film, with sick humor sprinkled throughout. The full name of the movie undoubtedly affected the draw for the common moviegoer as well, with the full title being called Deranged: Confessions of a Necrophile. This isn’t a debate as to which film is better. That appears to be a moot point, as both are phenomenal. For whatever reason, the simple fact remains that one took the horror world by storm and the other did not. There is no reason to really compare one to the other, except possibly in terms of source material. And in that regard, Deranged is simply more accurate. Whether that makes it a better film is up to you. The film would have a short release and then disappear for about a decade when underground horror fans would begin to write and speak up about the movie. In 1994 movie would get a home video release, but it would only make a small splash in the gigantic, bloody ocean that is horror cinema. This tiny little independent film is still relatively unknown today. This may sound controversial, but I believe that many – not all, but a good number of them – “hidden gems” in this genre were hidden for a reason; not really gems. I do not believe that Deranged is in the same caliber as the films that fall into the “false gem” category. It’s a little rough, a little clumsy, but it has a charm that few other horror films have ever been able to capture. Seek this movie out and watch it on the next moonlit night.